Today I will go over various items of interest found in the estate record of Lee-o-netto. The estate was administered by Leon Horton, son of Caroline A. (Kanistanaux) Horton. Mrs. C. B. Mosman of Allegany claimed Lee-o-netto owed her for 26 years of “work, labor, and services” at $3/wk. Her claim was denied. Besides all the above, the papers mention the usual payments for taxes, insurances, and maintenance of the properties as well as other normal and expected expenses. Randy’s great aunt (Leon’s daughter) believes the small house in East Randolph was located next to the house Leon owned and was purchased by Nettie for Fred & Carry when their health was failing and Fred could no longer farm. Finding she owned property in Springville was a big surprise. The property is of much greater value than the E. Randolph property she bought for her sister. Springville is located 30 to 40 miles north of Allegany. Springville is the same town where she kept her bank accounts. Her checking account was at Springville Citizens Bank and she had money in the Farmers Springville Bank. These are the only bank accounts she had. It seems curious to me that she kept her money in banks so far away from where she resided. I have not discovered anything to suggest she ever lived in Springville, but there are a number of census years in which I was unable to find her. The town does not appear to be near anything of any particular interest nor any of the places she or other family members are known to be living. I wonder what it was that attracted her to this town and why she kept a good part of her wealth there, but did not reside there? Orla E. Black of Salamanca, NY is listed in local directories as a County Judge and is also found listed as a lawyer. He was paid to “settle” two items for the estate. He was not the Judge of the Surrogate Court (where the probate process occurs), so I guess it would not be a conflict of interest. Kreiger & Prey is a law firm located in Salamanca. A Mr. A. E. Krieger of Salamanca is listed as the County’s District Attorney. I suspect this is the law firm handling the claim of Mrs. C. B. Mosman against the estate. I am sure there is a very interesting background story that goes along with her claim to being owed for 26 years of service. I think I will save any further discussion for another post. Gertrude Fowler paid the estate $1000. Mr. Orla Black was involved in settling something with her. Perhaps the Surrogate Judge felt the sale of the house was improper or perhaps she was required to pay for any contents she decided to keep. Mrs. Fowlers purchase of the Allegany property just weeks before Nettie’s death for prior services and one dollar may have inspired the claim for prior services by Mrs. Mosman. Since Mrs. Mosman’s claim was denied, perhaps Mrs. Fowler was not allowed any value for her services either. Joseph A. Wintermantle is listed in local directories as a Physician with offices at 4 East Main, Allegany. He is probably only a few blocks away from Nettie’s home at 54 West Main. The doctor does not appear to be a herbal doctor. Why was Edward Vallely paid $110 for services? What kind of services did he perform for the estate? I looked him up in the 1940 Census and his occupation is “Locomotion Engineer” for the “Steam Railroad”. He was also an R.R. Engineer in the 1930 Census. I just can’t imagine what service he might provide that would cost $110. If a train was involved in her funeral, I would expect the cost to be that of a ticket and paid to the railroad company rather then an engineer. The same would apply if she had personal property in Springville that needed to be freighted to Allegany. If he just tooted his whistle as he passed the funeral procession – well, that’s a pretty expensive salute. Any of my readers have any suggestions? I decided to Google the companies Nettie had stock with. I didn’t have any luck learning about the National Products Company. There is a company by that name operating today, but they did not begin business until 1941 – after Nettie’s death. I fiddled with my search but only modern material popped up so I decided not to waste research time on this. I was more successful with the other company. I love Google Books. The “India Rubber Review” dated 15-Mar-1919 shows the Wenstone Rubber Products Co. of Chicago under “New Incorporations” on page 162. The “United States Investor” issue of 4-Nov-1922 stated stock in this company was unattractive at that time. The company produced “Puncture Sealing Inner Tubes” and were planning to expand into tires but competition was stiff. I didn’t take the time to research either of these companies in newspapers and local directories, but those resources would be the next place to look if I decided this was something important to my research. I encourage my readers to pursue this type of side-tracked research whenever possible because you never know when or where you might run into long lost Uncle Joe or sister Susie. There is another benefit. You get to learn about the character of the person you are researching. The draw back is getting too far off-track of your main goal and expending to much time. In this instance, I don’t believe either of these companies will lead me to Lee-o-netto’s ancestors, so now is a good time to move back to my main subject. I can always come back to this later if I change my mind. After settling Nettie’s entire estate there was $684.87 plus the two rental properties valued at $3100 for a total of $3784.87. This was divided equally between Leon and his two sisters, as sole heirs to Dr. Lee-o-netto’s estate. They each received a little over $1260 before taxes. I found it very interesting that William Kanistanaux received only $300 out of the estate. 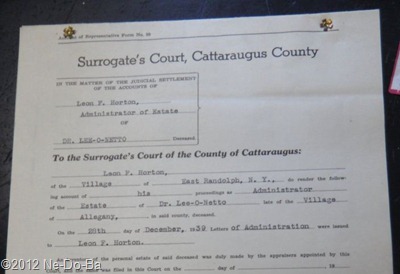 The wording used in the probate record suggests the Surrogate Court did not accept William’s claim to being a blood relative. Since William did receive some money, there must have been a reason to include him. I certainly would like to learn what information was provided to the judge. The current belief is that William is a grandson of Marleah Kanistanaux. Carrie, Henry, and Lee-o-netto are the presumed children of Marleah. If this is correct, then one of William’s parents would be a child of Marleah and presumably a sibling (or half-sibling) to Carrie, Henry, and Lee-o-netto. Henry died prior to Lee-o-netto and without issue, so he is out of the equation. Lee-o-netto had no children. Carrie and William’s parent should be the sole heirs to Lee-o-netto’s estate with each receiving half (just under $1900 each). Since Carrie has passed away, her half would be divided equally among her children and the half belonging to William’s parent would all go to William. This of course assumes that Carrie, Henry, and Nettie are actually children of Marleah (which is not a proven fact). This estate record appears to be suggesting Carrie, Henry, and Lee-o-netto do not share a blood relationship with William. The only thing I know for certain at this point is that Carrie, Henry, and especially William where raised by Marleah and Laton. Lee-o-netto’s funeral services were quite expensive. The death notice in the newspaper didn’t mention anything about a big wake or fancy shindig of any kind. After seeing photos of her monument and urn at the cemetery, I would imagine a good portion of the expense went towards the stone work. I also suspect her casket was just as fancy and expensive. look for additional probate files which might contain testimony, especially concerning William’s failed claim.